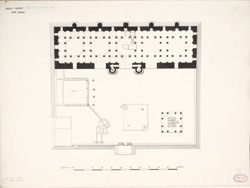 Plan of the Jami masjid at Dholka in Gujarat from James Burgess' 'Original Drawings [of] Muhammadan Architecture in Gujarat.' Located in Dholka, located 23 miles southwest of Ahmadabad, the Jami masjid, or Friday mosque, was constructed in the late fifteenth century. The mosque's interior measures approximately 100 by 33 feet and consists of five domes each supported by twelve pillars. The central dome is raised to twenty-seven feet and is supported by ten pillars and two pilasters. The back wall is decorated with six windows with perforated tracery work. On each end of the mosque there are an additional three windows with similar perforated designs. Along the back wall, there are five mihrabs or prayer niches. The central mihrab is the most elaborately decorated with carved designs. On the façade of the mosque there are two minarets, flanking either side of the main entrance and also have decorative designs in the niches. The mosque's courtyard measures 149 by 76 feet and contains a water tank, well, a tomb, and three graves.